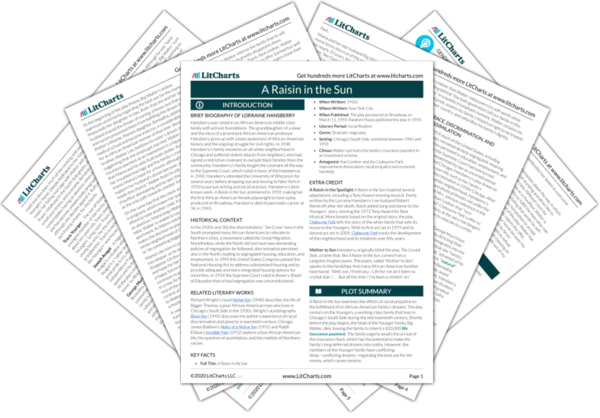 Instant downloads of all 945 LitChart PDFs (including A Raisin in the Sun). An hour later, Walter’s loss of the insurance money fills the apartment with “a sullen light of gloom.” Asagai enters the apartment to visit Beneatha, who is deeply upset about the lost money. Beneatha explains the situation to Asagai and he asks her how she is doing. Beneatha responds, “Me? . . . Me, I’m nothing.” She then recounts the story behind her initial desire to become a doctor, telling Asagai of a childhood friend who was severely injured in a sledding accident. Beneatha tells Asagai that she was amazed that “one person could . . . sew up the problem, make him all right again,” although she states that she has now lost her youthful idealism. With the loss of the money to fund her dream, Beneatha appears to have lost her pride in her identity, which was intimately tied to her dream of becoming a doctor. Without her dream to anchor her identity, Beneatha is unmoored and disparages her youthful hope and idealism. Asagai tries to convince Beneatha of the value of idealism, but she rejects his arguments. She mocks Asagai’s dream for African independence, asking him about what comes after freedom: “What about all the crooks . . . who will come into power and steal and plunder the same as before – only now they will be black and do it in the name of the new Independence.” When Asagai responds, “That will be a problem for another time,” Beneatha refuses his answer and rejects his idealistic belief in human progress. Having lost her own dream, Beneatha attacks Asagai’s idealistic dream for African independence. With her cynical statement on African freedom, Beneatha anticipates the problems that many newly formed African nations did face. Instead of celebrating her African heritage, Beneatha now focuses on the problems that will plague a free Africa. Asagai raises the important distinction between money that is earned and money that is simply inherited. He criticizes Beneatha’s overemphasis on money that she did not earn and scolds her for hitching her dream, however noble, to the death of her father. When Beneatha accuses Asagai of being unable to provide an argument in favor of idealism, Asagai shouts, “I LIVE THE ANSWER!” He tells Beneatha that violence and revolution may well be the price of independence. He presents Beneatha with a hypothetical situation in which he holds political office in an independent Nigeria, explaining that murder at the hands of “my own black countrymen” would constitute “an advance” over murder by white colonial forces. By using himself as an example, Asagai explains to Beneatha that progress occurs in starts and stops, encouraging her to hold on to her dream despite this recent setback. He explains that a free Nigeria – even if it still contains violence, even if it kills him – will constitute progress towards a better future. “Rather quietly,” Asagai suggests that Beneatha “come home” with him. At first, Beneatha mistakenly believes that Asagai is merely asking her to come to his apartment and, exasperated, she dismisses his ill-timed suggestion. Asagai quickly clarifies his meaning, adding, “I mean across the ocean: home – to Africa.” Beneatha is amazed by Asagai’s offer, which is tantamount to a marriage proposal. Asagai says, “In time, we will pretend that – you have only been away [from Africa] for a day.” He embraces Beneatha and passionately kisses her. Suddenly, she pulls away, overwhelmed by the events of the day. Beneatha tells Asagai that she needs time to consider his proposal. He exits, leaving her with her thoughts. Beneatha is touched but overwhelmed by Asagai’s unexpected proposal. Although she takes great interest in her African roots, her initial confusion over Asagai’s meaning of “home” may signal that she does not go so far as to imagine Africa as her home. Additionally, the implied marriage proposal complicates Beneatha’s dreams, which prioritize her ambition to become a doctor over marriage. Walter enters from the bedroom and “feverishly” begins to look for something. Filled with disgust for her brother, Beneatha launches into a “monologue of insult,” mockingly calling Walter an entrepreneur. Walter ignores her comments and finally finds a small white card. He puts the card in his pocket and rushes out the door. Beneatha uses her brother’s irresponsibility with money as a weapon with which to further diminish his self-esteem. She lampoons Walter’s aspirations of material wealth and power. Returning the plant in its usual place by the window, Mama signals that she has given in to the dissolution of her dream and resigned herself to the fact that the family will remain in the apartment. With the loss of the money, Mama loses both her dream and her sense of pride, stating that she simply “aimed too high.” Mama references the people who found her too “high-minded,” recalling Mrs. Johnson assimilationist perspective. Ruth offers to make tremendous sacrifices to make the family’s dream a reality. Walter reenters and tells Mama, Ruth, and Beneatha that he made a phone call to “The Man.” Beneatha realizes that Walter is referring to Karl Lindner and questions Walter about the call. Walter states that the family is “going to do business with him.” Walter begins a speech about the divisions in life between “the takers and the ‘tooken.’” Walter says that the Youngers, part of the “tooken,” are “all mixed up” because of their preoccupation with “the right and the wrong.” He sarcastically thanks Willy Harris for teaching him how “to keep my eye on what counts in this world,” by which he means money. Walter’s speech recalls his earlier assertion that money is “life.” He emphasizes the overriding importance of money, which he believes carries more weight than moral distinctions between right and wrong. He resents his status as part of the “tooken” and is willing to sacrifice his pride in order to become a “taker.” Walter covets the control and power that “takers” exert over the world. Mama mourns her son’s decision to sacrifice his and the family’s pride for financial gain. She laments his decision to accept Lindner’s humiliating, prejudiced offer, which also signals Walter’s implicit acceptance of racial stereotypes. Mama invokes the generations of slaves and sharecroppers who, despite their dire financial straits, at least maintained their pride in the face of crippling racial discrimination. Walter protests, shouting, “I didn’t make this world! It was give to me this way!” He asserts that he is a “man” and, as such, he wants the ability to financially support his family. He gives his family a preview of the “show” that he plans to put on for Lindner, dropping to his knees and “groveling” in an “anguished imitation” of a “slow-witted movie stereotype.” He says that he will tell Lindner to “just gi’ ussen de money . . . [and] we’s ain’t gwine come out deh and dirty up yo’ white folks neighborhood.” His family looking on in horror, Walter then “breaks down” and goes to his bedroom. Walter’s pained imitation of an African-American stereotype marks his complete loss of dignity and shows the lengths to which he will go in order to obtain Lindner’s money. Walter declares his manhood but nonetheless behaves childishly and cowardly. He resents that as an African American man in mid-century Chicago he is unable to fulfill the mainstream male role as a financial provider for his family. Beneatha sneers that Walter is “not a man . . . but a toothless rat.” Mama asks Beneatha if she is “mourning” her brother’s loss of pride, to which Beneatha answers that Walter is “no brother” of hers. Mama scolds Beneatha’s lack of compassion, telling Beneatha that she should love Walter the most when he is “at his lowest and can’t believe in hisself ‘cause the world done whipped him so!” Mama tells Beneatha to mourn her brother, not the insurance money that he lost. Mama criticizes Beneatha for her lack of empathy and for placing concerns about her own dream before concerns about Walter’s debilitating loss of pride. She urges Beneatha to release her anger and love her brother, hoping that the family’s love can repair the damage that the world – and racial prejudice – has done to Walter. Walter’s boyish demeanor when greeting Lindner represents the loss of manhood that has been brought about by Walter’s decision to sacrifice his pride. Mama’s demand that Travis witness Walter’s decision to accept Lindner’s bribe is a last-ditch attempt to appeal to Walter’s sense of dignity. In the presence of his son, the next generation, Mama hopes that Walter will honor the sacrifices of earlier generations and show that same pride even in terrible circumstances. Walter begins his conversation with Lindner meekly, telling him that the Youngers “are very plain people.” Looking down at his feet, Walter tells Lindner that his father, Big Walter, was a laborer. Lindner, “absolutely confused” by the point of Walter’s comments, focuses on the contract. Suddenly, Walter stares at Lindner and assumes a “sudden intensity.” He tells Lindner that his father once “almost beat a man to death” for calling him “a bad name.” Lindner is utterly confused. Gaining confidence, Walter continues, stating firmly, “What I mean is that we come from people who had a lot of pride.” He adds that his sister Beneatha plans to become a doctor. And though Walter begins slowly and meekly, as he tells Lindner about the accomplishments of his family, he gradually gains confidence, evidenced by his ability to look Lindner in the eye. Remembering the pride that Big Walter took in his racial identity, Walter begins to revise his decision to accept Lindner’s offer. Walter even celebrates Beneatha’s dream to become a doctor, a marked change from his earlier criticism of his sister’s ambition. In a hugely transformative moment, Walter reaffirms his and the family’s pride and, further, by referencing the six generations of his family to live in America he asserts that he is as American (and, likely, more American) than Lindner himself. He also identifies the house as the fulfillment of his father's dream, and moving to the house is thus something earned (recall Asagai's comment to Beneatha earlier in Act 3) and not something inherited. Walter's comment that the family won’t “fight no causes” distances the family from more radical factions of the civil rights movement. Walter is saying that the family will be good neighbors to the white people of Clybourne Park, but he is also asserting their right to be neighbors of those white people. “Coming to life,” Mama and Ruth fly into action, making the final preparations for the family’s move to Clybourne Park. They “deliberately” try to ignore “the nobility” of Walter’s decision, focusing instead on the task at hand. Beneatha excitedly tells Mama that Asagai proposed to her that afternoon, but in the busyness of the moment Mama brushes off the conversation. Walter picks up the conversation and tells Beneatha that she should marry “a man with some loot.” Beneatha and Walter exit while arguing with each other. Interestingly, the family’s reserved dignity prevents it from taking excessive pride in Walter’s decision. They wordlessly and internally celebrate his moral victory without shamelessly celebrating the moment. Walter’s insistence that Beneatha marry someone with money signals that the family still has its disagreements and also shows Walter’s continued preoccupation with money. Not everything has been fixed. Not everything is perfect. But they still have their pride, and they still have each other. Making final preparations to leave the apartment, Mama references Walter’s confrontation with Lindner, asking Ruth, “He finally come into his manhood today, didn’t he?” Biting her lip to contain her own pride in Walter, Ruth agrees that he did. Ruth exits, leaving Mama alone in the apartment. Mama looks around at the family’s home and, overcome with emotion, stifles a cry. She exits the apartment only to reenter a moment later, retrieving her plant and leaving for the final time. Ruth and Mama take great pride in Walter’s moral victory over racial prejudice, recognizing that his decision marks his transformation into a man. Mama’s decision to take the plant to Clybourne Park symbolizes a new beginning for the family’s dreams, but also hints at continued struggles for the family at its new home. Jumper, Alexandra. "A Raisin in the Sun Act 3." LitCharts. LitCharts LLC, 17 Oct 2013. Web. 23 Apr 2019. Jumper, Alexandra. "A Raisin in the Sun Act 3." LitCharts LLC, October 17, 2013. 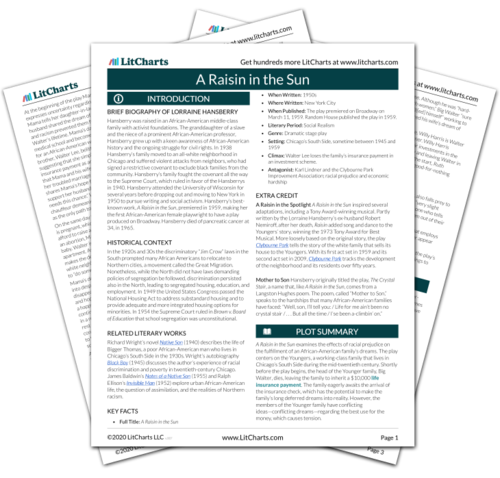 Retrieved April 23, 2019. https://www.litcharts.com/lit/a-raisin-in-the-sun/act-3.